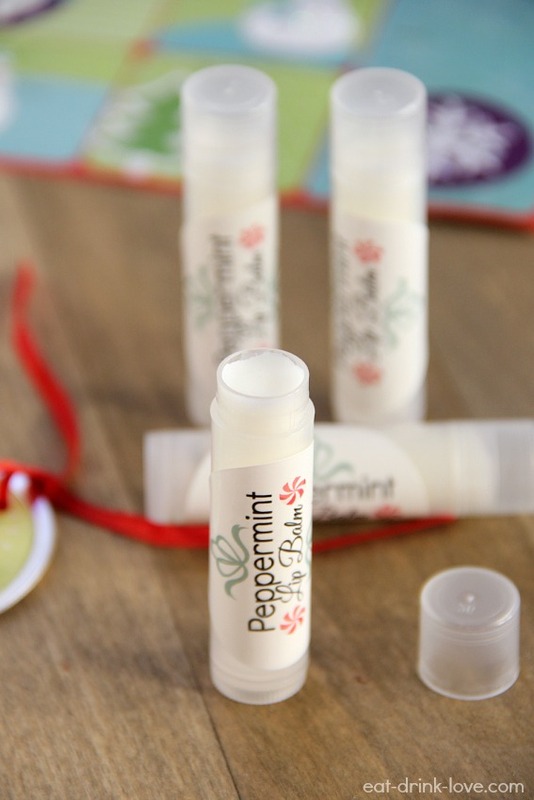 Homemade Peppermint Lip Balm (plus free label printable!) - Eat. Drink. Love. If you guessed chapstick, you are correct. I think my addiction started back in high school. I am that girl that has 5 different tubes in her purse. I am that girl that has 5 more in her office. I am that girl that has 5 more spread around the house. My name is Stephanie and I am addicted to chapstick. I decided last year that I wanted to make some sort of homemade gift every year for Christmas. Last year, it was rice therapy sacks. This year, it’s homemade lip balm. 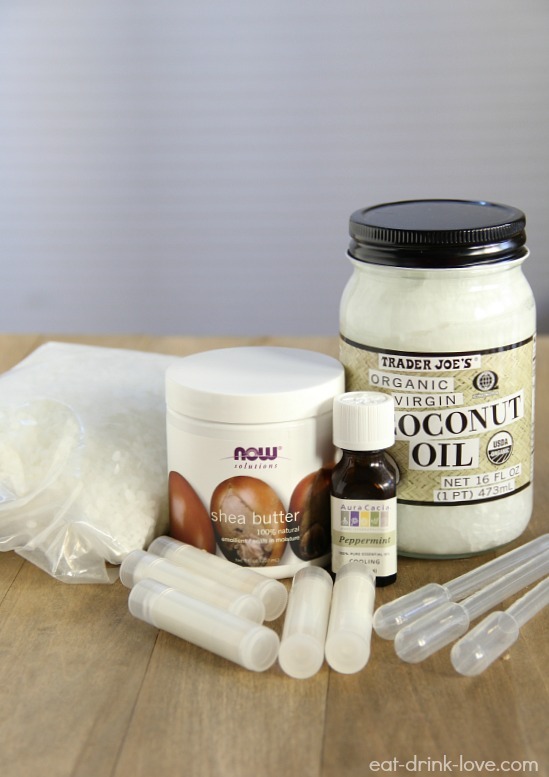 I was pleasantly surprised to see how easy it is to make your own lip balms. It was really just a matter of ordering all of the ingredients and then melting a them in a bowl, pour it into tubes, and that’s it. 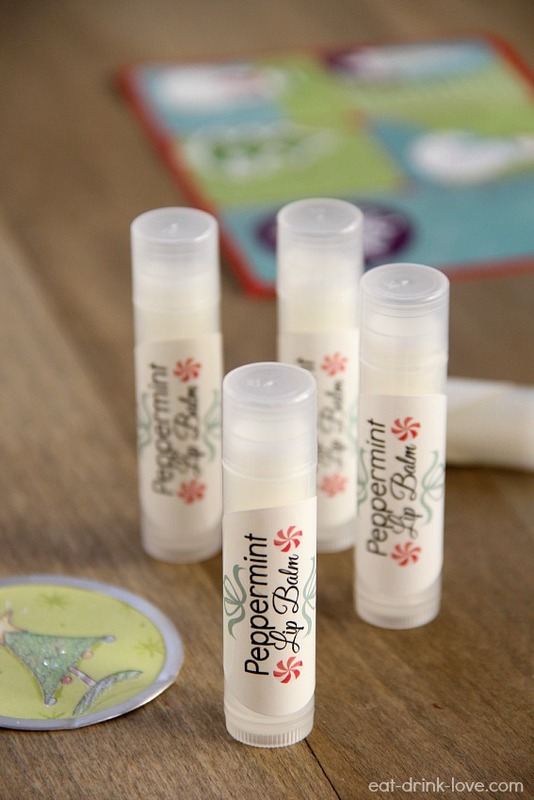 Although I don’t love eating peppermint, I do enjoy it in a lip balm and I thought it would be a good flavor to use this time of year. I also added a pinch of honey for sweetness and while it does taste good, some sunk to the bottom of each container so just be sure to stir the mixture often so it doesn’t separate. For the labels, I would have preferred square, but I happened to have round labels already so I just used those. I made the design in PicMonkey. 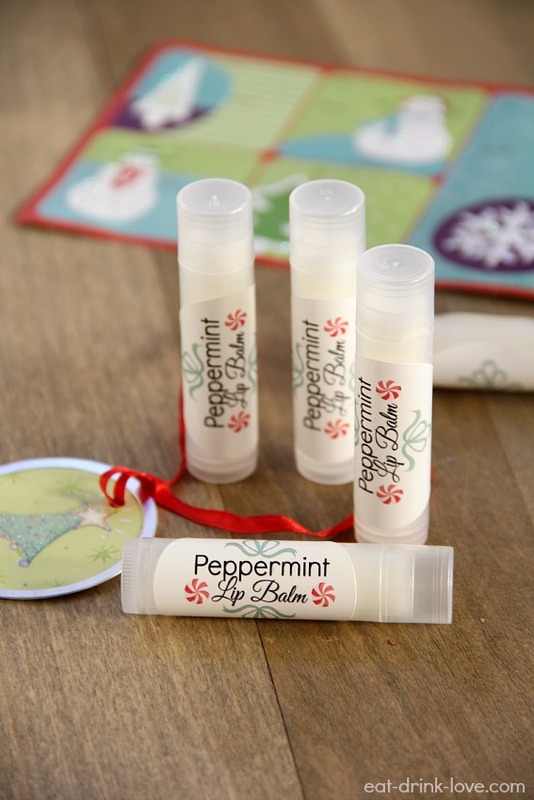 These little lip balms make great stocking stuffers this holiday season! 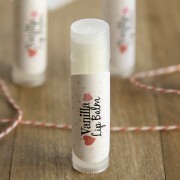 Making your own lip balm couldn’t be easier and it makes for great little gifts! Melt the shea butter, coconut oil, beeswax, and honey in a double boiler. Whisk together until completely melted. Then stir in the peppermint oil. Use a pipette to divide the liquid amongst the tubes, filling them. I recommend leaving the bowl over the boiler if you don’t want to rush to transfer the liquid into the tubes. Stir what’s left in the bowl every so often while transferring to prevent separation. Let the balm set with the caps off for 12 hours. Label if desired. If you want to use the labels I made, here is a free printable version! These are compatible with Avery 5293. How crafty! I have about a million tubes of chapstick around the house, car, and office too. I never knew it was so simple to put together. I have all of those ingredients. Sounds like a fun weekend project next snow storm. I was surprised how easy it was too, definitely a good snow day project! I had no idea you could actually make chapstick. My daughter would love to do this. Hey stranger! Yes, it’s a great project to do with kids because it’s really easy, just gotta keep an eye when at the stove. Hope you’re well! I love little homemade gifts like this!! Lipbalm is so perfect for the holiday times or during the cold months. 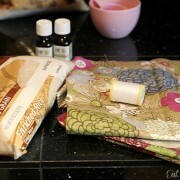 Nice recipe Steph and your photos are beautiful!!! Oh and I almost forgot, I LOVE the new look of your blog!! These are too cute, I love the little labels you made! And your blog looks AWESOME, I especially love the header, and everything is so fresh and pretty! I’m working on a redesign right now and it is harrrrrd to think of everything and narrow down the options. Thank you, Anna! The header is one of my favorite things too. haha you are not alone – I am soo addicted to chapstick! I would have never thought to make it at home – so cool! And I love your re-design! It looks great! Girl, we are on the same page. I made homemade peppermint balm for Christmas, too. And, I also had my blog redesigned by Purr. Your site is absolutely gorgeous. Lindsay does amazing work. Ahhh! Yours looks awesome too! She’s the best! I was wondering if the Pic Monkey website caused you any problems. I was looking into using it for labels and it glitches terribly to the point that I cannot even read the content. Thanks for the recipe. Hi Cathy, I use PicMonkey a lot and don’t usually have any issues. If you want to use the same round labels I used, I can email you my labels. Let me know! Love this idea! Thank you for sharing. I do have a question though.Where did you buy the tubes? Hi Joan, I bought everything on Amazon! THOSE ARE SOME REALLY SASSY LIP BALMS YOU MADE . MY FAVORITE FLAVOR IS RASPBERRY . I BET THAT RASPBERRY MIXED WITH THE PEPPERMINT WOULD BE REALLY NICE . I WAS GOING TO TRY MAKING MYSELF SOME STUFF LIKE THIS AND PUT IT IN A FLAT, METAL SLIDE TOP TIN . I KINDA GOT INTIMIDATED BY THE PROJECT. YOU CAN ORDER THOSE FLAT SLIDE CASES FOR LIPGLOSS AT AMAZON.COM . LOTS OF OTHER SITES HAVE THEM , BUT I USUALLY GO TO AMAZON. THOSE MEATAL TINS WOULD BE GREAT FOR YOUR NICE GLOSSES . IS THER SOME WAY TO BUY SOME YOU HAVE MADE YOURSELF ? YOU SHOULD OPEN YOU A PLACE TO BUY YOUR STUFF !!! 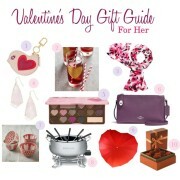 I THINK LOTS OF GIRLS WOULD LOVE YOUR STUFF !!! What size/type labels did you use? I believe mine are Avery 5293 (round). I was wondering where you get the tubes to put the lip balm in. I can’t my labels to stay on! Even after washing the tube and the obvious things. Did you have any issues?? Hi Jen, I haven’t had that problem. It’s likely either the type of label you are using or the tube. I use Avery labels. I believe Natural Cosmetics is the brand of the tubes I use. Hope this helps! Could you please let me know the weight of the beeswax required. It is much easier to weigh it before it’s melted than to try to measure it afterwards. Thanks so much – I love your recipe! Denise, it’s 1 1/2 tablespoons unmelted beeswax. You will melt everything together after measuring. I love this! But I can’t get the labels to print. 😢 Is there any possibility you could email them to me?